The type of damage that can be caused by these accidents can be minor, but it can also be very serious. Seat belts and seats with headrests help to prevent or minimize serious neck injuries after car accidents. The majority of the pain created by whiplash is due to tightened muscles that are either reacting to muscle tears or are trying to act as a splint for the neck, eliminating excessive movement. These tightened muscles can lead to headaches or pains radiating down the back of the neck and shoulder blades. 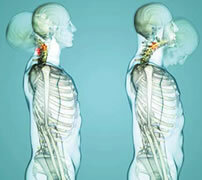 If you have a very sore and stiff neck after an accident it is a good idea to have a doctor evaluate you. He or she will be able to tell you if it is safe to treat your injury with measures designed to make your more comfortable, like hot or cool packs, gentle massage, and stretching exercises. If there is any question that you may have an injury to your neck that is more serious than a muscle sprain or strain, then they will be able to evaluate you further.